My husband I have a Google Docs spreadsheet where we can keep track of our cars’ gas mileage with each fill-up. However I haven’t been as regular with my data entries as I planned. I decided to use Fuelly to track our cars’ performance. I wanted to share a brief for those readers who are looking to lower their gas bills. 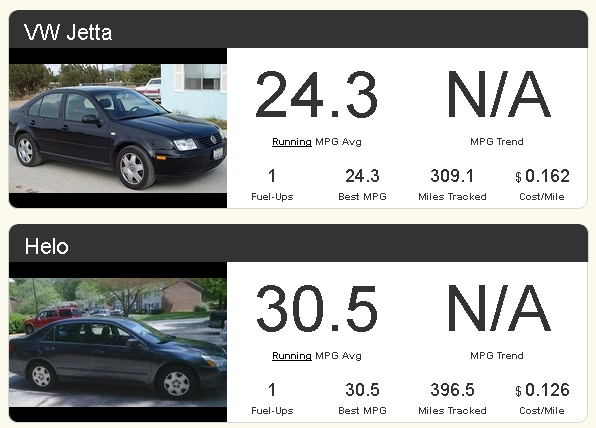 You can also use Fuelly to look up different models and see what’s the average gas mileage. That can be a useful when you’re narrowing down your list for car shopping. As you can see in the image with this post, the Accord has better mileage than the Jetta. It’s one fuel-up, but it’ll be fascinating to see how the two do. Since we deciding on whether to keep the Celica or the Jetta, having gas mileage handy will help us compare annual fuel costs. I’m happy to see that there is mobile app for the site, so any member can update their stats as soon as they finish a fill up. Can’t I do this myself? In short yes I can. 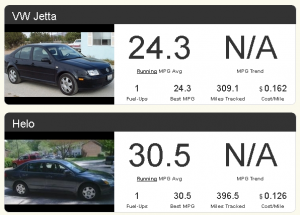 Fuelly makes it easy, but tracking gas mileage isn’t rocket science. That’s not the strength of Fuelly though. It’s the community that makes it a handy tool. How? Along with stats from other users, there is a huge list of member submitted tips on saving on your fuel plus there is an active forum where you can start and follow along different topics in the threads. Of course while I appreciate the camaraderie, I’m going to use Fuelly in a different way. I’m using the data from the site to challenge myself to be better than the average member. Right now the average mpg for a 2007 Honda Accord is ranging from 25-28 (combined city and highway driving). My goal is to consistently average at least 30 mpg over the next 3 months. I’ll be using Fuelly as my to track my gas mileage. If you want to friend me on Fuelly, look for ElleCMB. I’d love to start an unofficial group where we can encourage one another and improve our gas mileage with driving. How about you? How do you track your car’s gas mileage? What’s your average MPG?